Front Snap Bra features an easy front closure for ease of dressing. Covered elastic and superior styling to achieve the most comfortable, supportive but non-constricting bra. Comfortable non-slip wide shoulder straps. Very soft cotton with a touch of spandex for added stretch. Full-coverage style. Smooth seamless appearance.Small Bust 30"-32" Med Bust 34"-36" Large Bust 38"-40" XL Bust 42"-44" 2X Bust 46"-48" 3X Bust 50"-52" 4X Bust 54"-56" 5X Bust 58"-60"
Features an overlapped back that closes with snaps at both shoulders. Adaptive open-back, shoulder snap style top makes for easier dressing. Full back overlap with 2 snaps at each shoulder. Easier dressing for those with ventilators or trachs. Just tuck shirt under tubes and snap closed. Arms do not have to be raised or stretched overhead. Sleeves just slip on and the shirt snaps closed in the back. Water repellent Supplex outer shell.Fully lined for extra warmth. Unisex-suitable for teens, men or women. Full length front assures protection from rain from head to toe. 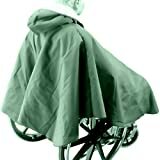 Shorter truncated back prevents the poncho from becoming entangled with the wheels of the wheelchair.